The Letter C… – Butter, Baking, and Bacon! The letter “C” reminds me of Oscar the Grouch singing,” C is for cookie and cookie is for me!” But sorry to say, Oscar, today that same “C” is for CARROT CUPCAKES! Several friends told me how much they disliked carrot cake, but after they tasted these, they were sold!! Carrot was pureed with fresh pineapple and creamy butter and mixed in an ethereal batter. 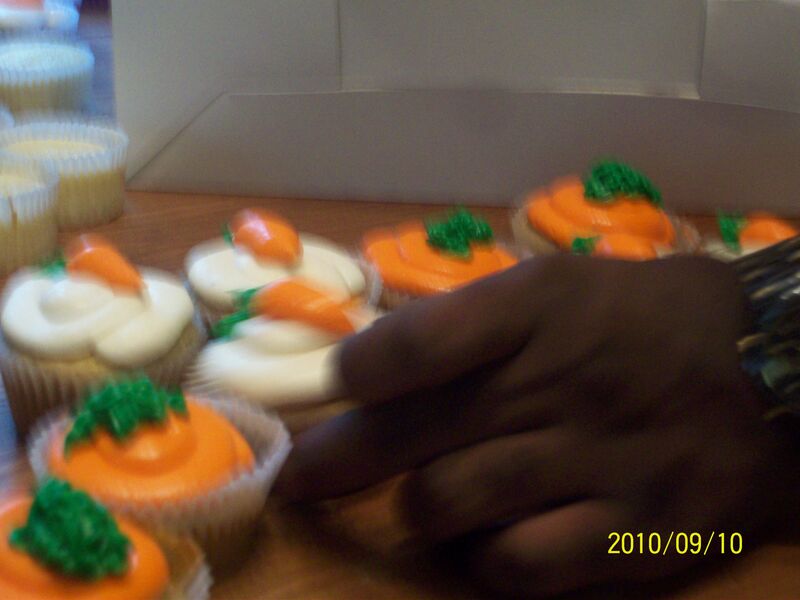 They were topped with a nutmeg cream cheese buttercream and decorated with piped carrots, courtesy of my fiance Mike! Next Post Ooey Gooey Flaky Cinnamon Rolls! 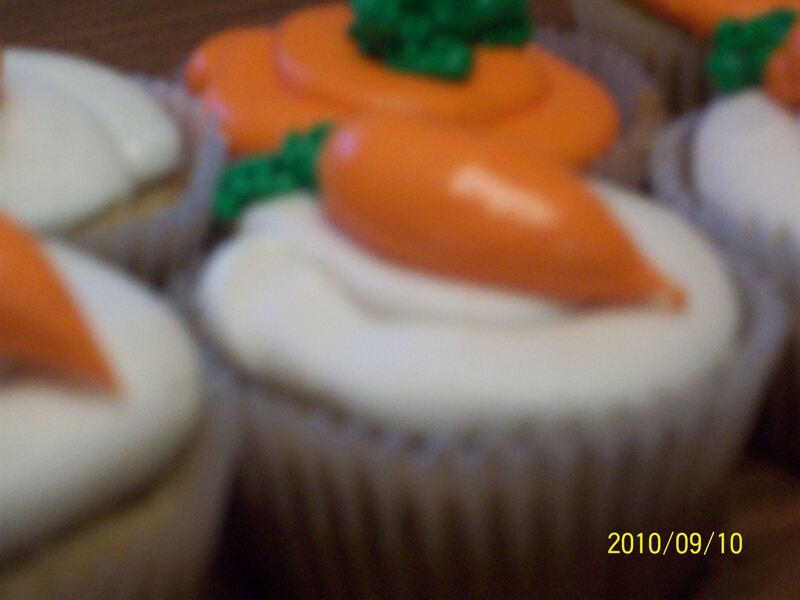 Carrot cupcakes are very nutritious and easy to prepare. Children will like them. So nice. Thanks. Carrot cubcakes is good for health. Nice idea. Some delicious cup cakes on display here. Thanks for the post. Looks Sooo Delicious – Mouth is watering! i am a real fan of carrot cake. it is a really good cake and it is full of nutrition. i use to prepare it in my home for all my birthdays. rich blend. carrot , pineapple and butter.. good for health. and tasty. nice. Wow, it’s delicious. Carrot cupcakes is so tasty and healthy. It’s really nutritious to children. Thanks for the idea! I have never tried CARROT CUPCAKES but after reading after reading you article im surely going yo try them. Its a wonder ful idea, carrot cake is just awesome. Carrot cupcakes is really delicious and good for health. It is also so nice to look. Thans for the blog. Just love cupcakes and great pics by the way. I love carrot cupcakes! They are really are not that hard to make for the mother on the go! Great website!! ITS IS A NICE COOKERY ITEM. Love this blog! The ideas and recipes are totally cool!!!!!! This is a mouthwatering cake for me, and carrots would taste the best in this form, thanks a ton for the article! Wow… superb…. Even the people who hate carrots would also love to eat this cake. Way to go, I think you really know how to drive everyone’s taste senses out of control! Your Cookie Monster story was hilarious and such a good example of showing your love for cupcakes-especially carrot cupcakes! Yum yum! I wish everyone like you would understand just how delicious carrot cupcakes or cakes really are, thanks for making me want to go home and bake some myself! Yum! These look incredibly gorgeous. Those are some cute cupcakes. How could anyone dislike them? I love carrot cake, these look scrumptious!! YUM! Seriously? Who doesn’t love carrot cake? Those sound absolutely delicious!! Te blog is simply delicious, in terms of items mentioned, because of mouth watering cupcakes and other varities. The blog is simply delicious, in terms of items mentioned, because of mouth watering cupcakes and other varities. I absolutely love this site! Thanks for putting a fun, fresh spin obn a cooking /recipe website!